Protesters outside of the Rock and Roll McDonald's in the River North neighborhood. 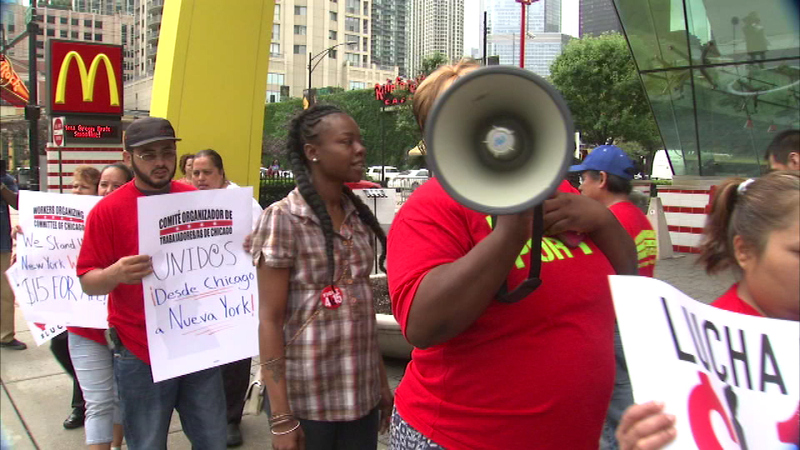 CHICAGO (WLS) -- Chicago fast food workers rallied again Monday for higher pay, pushing for $15 an hour in restaurants nationwide. Protestors rallied Monday morning in front of the Rock and Roll McDonald's in the River North neighborhood. The rally is part of a nationwide movement to help workers in New York win $15 an hour wages. New York state's wage board is recommending the pay increase. A minimum wage increase passed by Chicago City Council goes into effect July 1.